WHEN IS THE BEST TIME TO TREAT BARK BEETLES? Bark Beetles are small reddish to dark brown beetles about 1/4 to 1/2 of an inch long. Though they prefer live trees, they can and will feed on freshly cut wood piles at lumber yards or firewood. 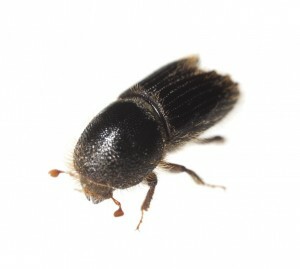 Bark beetles are the single most destructive pest which attacks pine trees. They are quick to reproduce, migrate and eat so once active on any one tree in a stand, it is important to start dealing with them immediately to minimize casualties. There are other species which will feed on a variety of hardwood trees but these tend to be slower at both reproducing and causing damage. Softwoods, like pine trees, tend to get damaged quicker and are able to provide harborage to more insects then hard woods over the same period of time. Bark beetles are attracted to pine trees by smelling the trees sap and pheromones of live, active beetles. 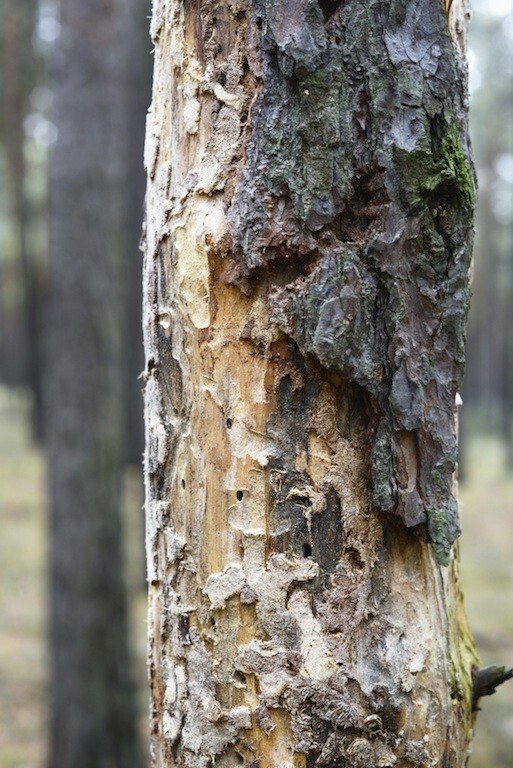 Though most trees will emit small amounts of sap naturally, trees which sustain injury due to man or nature are more likely to get beetle activity. 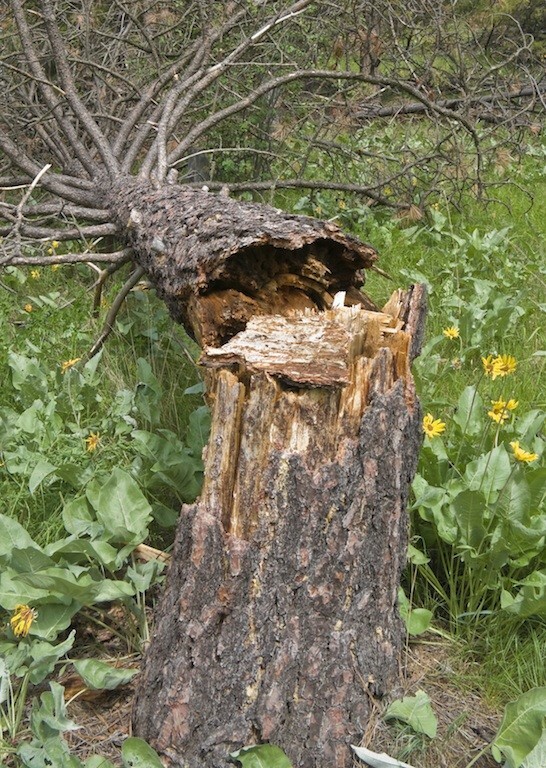 Pruning at inappropriate times (like the summer), mechanical damage by construction crews cutting protective tree bark, lightning, drought, disease or insect damage like that which can occur from termites can all make a tree more susceptible to pine bark beetles. Once a flow of sap is more than normal, the odds that beetles will find the tree are increased. A normal healthy tree will emit or release some sap that can attract beetles. When a tree is injured and sap runs freely and the odds that beetles find the tree are greatly increased. Once found, beetles will penetrate the bark and then begin excavating tunnels between the bark and the wood of the tree. These tunnels will serve as egg cavities. Eggs will be laid and when the larva hatch they will immediately begin to feed on the live part of the tree called the phloem and xylem. This feeding will lead them on a random journey which typically moves around the tree weakening it’s bark to the point of it falling off. Trees which have been severely damaged will shed their bark and appear naked; galleries and tunnels will be visible leaving a sure sign of what caused the damage. Once the larva get their fill, they will undergo a metamorphosis during which time they change to adults. This third stage is called the pupae and when ready, they will hatch and emerge from the tree. Their emergence will leave a bunch of new holes through which the attractive scent of sap along with their natural pheromones will attract even more beetles. For this reason it is always wise to treat any tree which you suspect may have a small amount of activity. In general, most healthy trees can withstand a beetle or two but if left alone, this initial activity will multiply to hundreds of beetles as new ones are attracted to exit holes. At least once a year. This is especially true if you reside in region with known activity. Once beetles are on your land and feeding on your trees, the scenario will change from “preventive” to “saving”. Unfortunately saving trees with extensive activity may be near to impossible. That’s not to say you shouldn’t tree. But letting the beetles have one “untreated” tree or removing the infested tree is not a bad idea. Just remember that remaining trees will quickly become targets if left unprotected. At that point you’ll need to make some decisions regarding how much “preventive” treating you want to do. The good news is spraying the bark once a year before you have activity can really help. 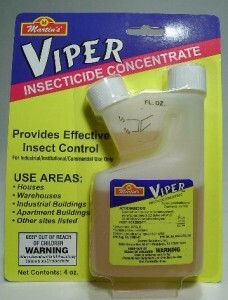 Combine this with a use a systemic and you can help most any tree from predatory pests. 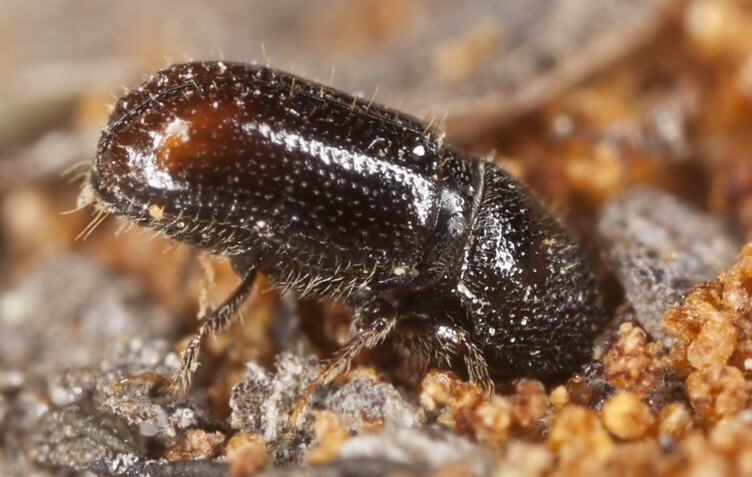 If you are in a region where bark beetles are active or if you have had some bad experience with them in the past, consider treating and protecting any tree you value. Such treatments should done at least once a year; once in the spring and once in the fall would be ideal. 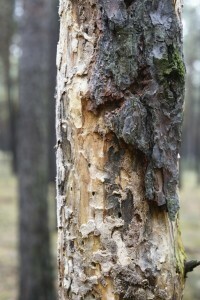 By spraying the bark you can help to establish a protective barrier through which beetles cannot enter. Furthermore, CYPERMETHRIN is highly repellent to most any insect so they will definitely leave treated trees alone. Treatments to the bark will last 1-2 months and even trace amounts of the active will be detected helping to keep the tree insect free. Mix it at the rate of 2 oz per gallon of water and expect to get up to 500 sq/ft of surface area protected per gallon of mixed spray. That means you should be able to get 5-10 average pine trees protected per gallon of mixed solution. For preventive treatments, focus on the bottom 10 feet of trunk but if the tree is showing signs of activity, treat as much of it as possible. Any standard PUMP SPRAYER can be used to do the treatment; just make sure it can reach the height needed. In general, you want to spray high first so that the material will run down the bark allowing you to maximize the area treated without spraying the same area over and over. If you know you have beetles already active on the tree, add SPREADER STICKER to the tank mix. This product makes the mixture “spread” over treated surfaces enabling the Cypermethrin to get better coverage and penetrate deep into the bark where active adults are chewing. In the long run you will be impacting much more of the tree when spreader sticker is included. It not only helps to cover the tree better but it allows the Cypermethrin to work that much faster. Beetles are naturally well protected from insecticides since they have thick shells. Spreader sticker helps get the insecticide “into” them much quicker. Add 1 oz of Spreader Sticker per gallon of water along with the 2 oz of Cypermethrin when treating live beetle infestations. For trees with current activity, spray as high as possible. 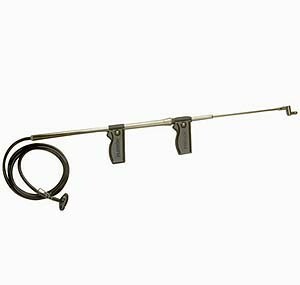 Pump sprayers will generally reach 10-15 feet which may not be enough. 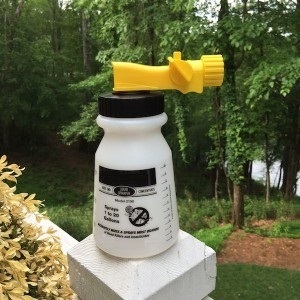 But if you have a garden hose with high water pressure, use a HOSE END SPRAYER to deliver the Cypermethrin and Spreader Sticker. Another high reaching sprayer is the TROMBONE SPRAYER. Its completely portable too. All you need is a 5 gallon pail with a mixed solution and you can bring it afield to treat remote trees too far away from a garden hose. Another option for treating light problems and the cracks and crevices of the bark is to inject some PT-CYKICK. This aerosol comes with a straw which can be inserted into small holes so that you can treat “into” the tree. The pressure of the can along with the aerosol sized particles which are released insures a thorough treatment. The use of this product will require less product and it will be distributed faster and more uniform. Simply insert the thin straw, hold the can on for 5-10 seconds and you’re done. Any beetles in the hole will be dead and the Cykick will provide long lasting residual so new beetles can’t use the same hole again. When a tree has been found with a lot of activity, you probably won’t be able to save it. The original thinking of handling such trees has been to remove the infested tree and then to burn it along with all the infesting beetles. However, this is not always so easy to do. One thing is for sure: If you have a tree infested with Bark Beetles and there are other trees close by, you need to treat the other trees ASAP. This preventive application should be done with the Cypermethrin and careful inspections of these same trees should be done monthly as well until the infested tree can be removed or taken down. There are other considerations regarding the infested tree. First, does it pose a threat to a home or wildlife should it unexpectedly fall? Trees that have been weakened by beetle damage will eventually crash to earth. Be sure the tree you have identified does not pose a direct hazard to nearby residents. Second, can the tree which is infested be removed? If the answer is yes, you should consider treating if before the removal. Remember, the act of taking down the tree will stir up adults causing them to leave. This exodus will undoubtedly allow several of them to find a new home elsewhere basically infesting another tree. Avoid this problem by treating the tree being removed with Cykick or Cypermethrin along with a thorough treatment of any trees you want to protect. Third, once removed, where will the dead tree be taken? Trees which have been treated prior to being taken down may have less active adults and larva but many will be active and thriving. 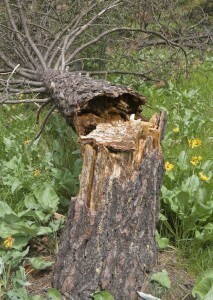 As a general rule you don’t want to leave a fallen tree laying around which is infested with pine bark beetles. They will quickly start to leave and nearby trees will become immediate targets. And since bark beetles will tract pheromones for miles, bringing it to the local dump may not be a good idea either so when possible, burn them. Something else to consider is the use of a good systemic. These are products you water into the ground around the trunk of the tree. Once injected, these products will be absorbed up into the tree and kill pests which attempt to feed on the treated tree. The best product for this is ADONIS. It can be sprayed on the tree too but it’s real strong point is when used as a systemic. 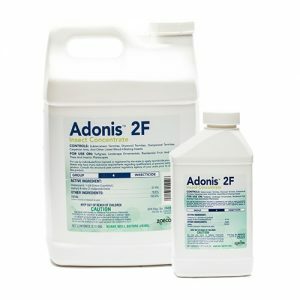 Though it will take a few weeks to make it’s way throughout the tree, annual treatments with Adonis can protect trees from most any insect infestation and help cure current problems. Remember, there is a huge range of insect pests which will target trees. And though one species may not be enough to kill it, a combined infestation can easily make a tree weak and cause it to succumb to the disease. For this reason protecting any tree you treasure with Adonis makes sense. Use Adonis at the rate of 1 oz per 10″ of trunk diameter. Mix it in 5 gallons of water and drench inside the tree’s drip line to insure good root absorption. Adonis only needs to be applied once a year and can really help “preserve” your trees overall good health. This was very helpful – not sure my trees can be saved but will get cypermethrin and merit wp to see if they can. It’s so sad. I lost several of the same trees several years ago in just a week’s time because of the fast activity of the beetle.